Apple just reported June quarter results, and as expected, sales were pretty flat — up just 1% from last year to $35.3 billion. It’s been a while since Apple has released any major new products, and it shows. Apple’s iPhone business, which represents a little more than half of the company’s sales, did better than expected. Apple sold 31.2 million iPhones last quarter, up from 26.0 million during the same period last year. 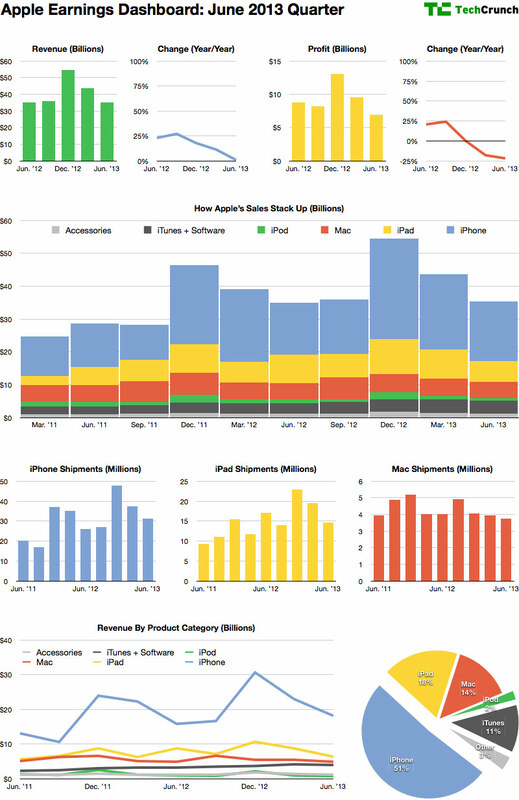 Here’s a visual look at Apple’s June quarter, in context with the last several. The big picture: After a rapid growth period when the iPad launched and the iPhone was getting into the swing of things, growth has slowed down. It’s time for something new, and we should start seeing more activity from Apple starting this fall. Dan Frommer is founder of SplatF (www.splatf.com), a tech news site, and City Notes (www.citynotes.io), a mobile travel startup. He previously helped create Business Insider, where he led Apple coverage. Follow Dan on Twitter at @FromeDome.